Every Saturday on Twitter, I do this thing where I list out the cleaning agenda I have on tap for my weekend and ask what everyone else is planning to clean. It sounds dull, but bear in mind that my list of chores usually includes a ringer like, “Treat lube stains on sheets from Thursday night,” so. Sooo...How Do I Get Lube Stains Out of Sheets, Anyway? Anyway. This past weekend, one of the replies was something along the lines of “I am going to dust all the things because holy cow, now that there is sunshine in the world again all I can see is the dust, everywhere.” Spring comes for us all, in its way. 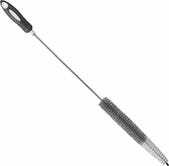 It made me think that I should do a round-up of specialty dusting tools that are available to you in this great wide world of ours, and so today I shall do just that! 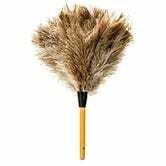 If you are a person who would be interested in cutting down on the amount of paper waste you produce, or who would like to save money, or who would like to introduce a little ooh-la-la into their cleaning routine, please come with me so that I may introduce you to the feather duster. Feather dusters! Yes! They are marvelous little things, and we should consider them more than we do. Here’s why: They work, and they are less expensive than disposable dusters like Swiffers and Clorox Dust Wipes. 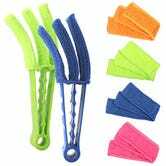 They are also almost unlimited in the number of uses you can get out of them; to clean a feather duster, simply hold it under gently running warm water, massage a pea-sized drop of dish soap into the feathers and rinse well. Roll the feathers in a towel and air dry. Voila! 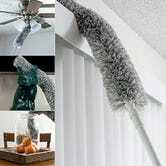 A clean feather duster, just add French maid costume. It pains me to inform you that there are dusty horrors lurking in your home that you are entirely unaware of, because you do not see them. But oh, they are there — dust sweaters. You know, dust sweaters! The thick layer of dust that gathers on flat surfaces that we can’t reach and quite often can’t see either. Those dust sweaters lurk on the top of frames; they have overtaken the tops of kitchen cabinets; they have befouled decorative trim. They are gross, but a telescoping duster will make short work of removing them, and also of quickly removing layers of dust and grime from other hard to reach spots, like ceiling-mounted light fixture bulbs and the tops of window casings. From up high to down low, we go! Vents and venting hoses need to be cleaned — especially the dryer vent, which should be cleaned to ensure the machine functions properly and to save on energy costs but also and very much more importantly because clogged dryer vents lead to dryer fires and dryer fires are REAL. While vacuums can be used to clean vents of all kinds, sometime they’re not powerful enough to really get in there and clear things out. Enter, the vent brush! This can be used on AC units, floor and wall registers, and of course, dryer vent hoses. Now you know! Unger Dryer and Vent Brush, 30"
Speaking of dusting slatted things! Window blind dusters exist in this world. (They’re also great for air conditioner window units.) Now, I will level and tell you that you do not need this tool. A feather or microfiber duster, or even a dryer sheet — oh just you wait, one day I will sing to you of using dryer sheets for dusting! — will do the job just fine but you know what? 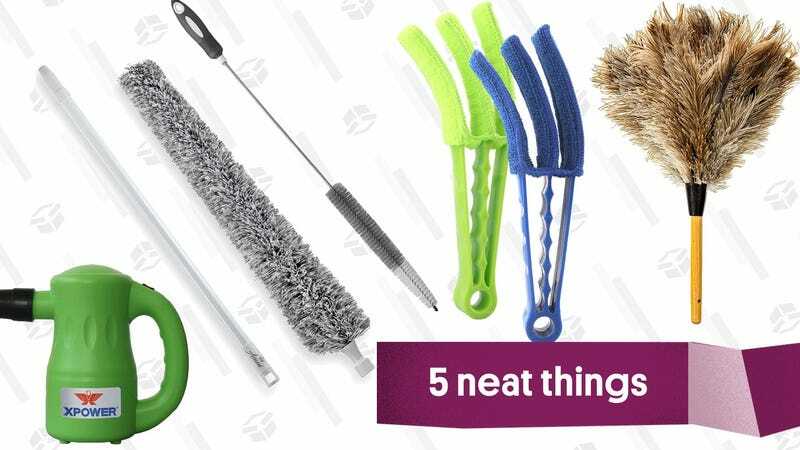 Sometimes it’s fun to have a weird duster in your life, and window blind dusters look like weird Simpsons hands, and I just feel like it’s okay to have a little fun with your cleaning, okay?!? OHHHHH YESSSSSS POWER DUSTERS COME TO MAMA!!! So look, much like the Simpsons finger duster, you don’t really need a $50 power duster in your life. 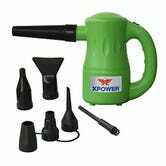 But, like, in an existential way you probably need a $50 power duster in your life, or at least I know I do. This thing is so boss, honestly: It’s got 7 attachments so you can convert it for use on cleaning everything from your disgusting car interior to your disgusting keyboard. The thing can be used to blowdry pets! YOU NEED THIS THING! !